Sample Pre-Conditioning System (SPS) normally provides the functions of coarse filtration, temperature regulation (cooling or heating), pressure regulation (reducing or increasing) so as to ensure the process samples can be easily handled by SCS and further analyzed by process analytical instruments or analyzers. 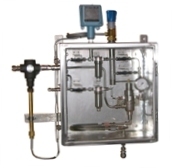 It could be simple as just one inline screen filter with one pressure regulator assembled on a metal plate but also could be complicated as a system including certified diaphragm gas or liquid pump, complex pore membrane filter, heated pressure regulating valve or vaporizer housed in an insulated enclosure. ● Dimension: 300W x 300H x 270D (mm) up to 800 W x 1,200H x 400D (mm) subject to the quantities of the selected components.